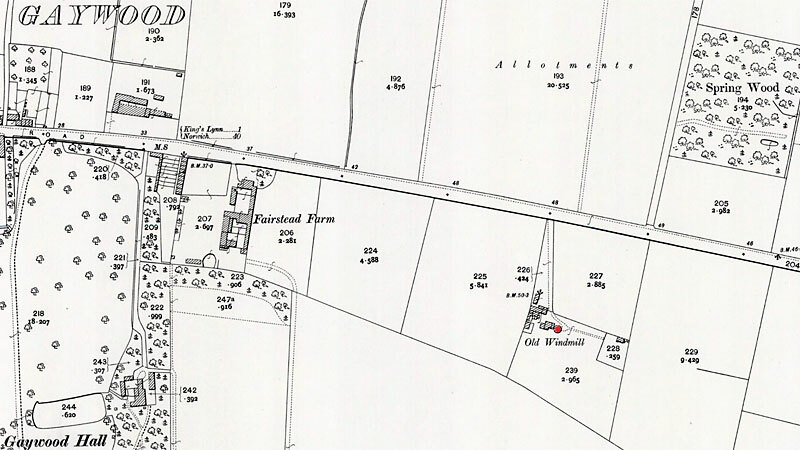 Fairstead post mill stood just to the east of Fairstead Farm and in the 1700s was standing on the south side of Gaywood Common. A horse mill was also worked on the premises. The mill had possibly ceased to work around 1886 as the internal machinery was advertised for sale in early 1887. However, it could well be that the machinery did not sell and the mill continued working for some years. Kings Lynn, January 29, 1800. All that CORN WIND MILL & HORSE MILL with the Machinery & other Apparatus thereto belonging & also the Dwelling House, Stable, Buildings & Pieces of Land thereto adjoining, containing altogether by estimation (with the site of the Buildings) 5 acres & 2 roods (more or less) situate in Gaywood, Norfolk. The above are very desirable Premises & are in excellent order & are within 2 miles of the Town & Port of Kings Lynn. Apply to Mr. Edward Lane Swatman, Solr. Kings Lynn. Robert Atmore, now or late of Gaywood, Co. of Norfolk, Miller, declared bankrupt. To surrender 10 November inst. at the Court of Bankruptcy, Basinghall Street, London. For sale by tender, the inside machinery of the said mill, consisting of 3 pairs of stones, viz., 2 pair of best French Burr, and 1 pair of best Derbyshire Peak, together with a large spur wheel, upright shaft, and all other connections and motions for a mill calculated to do extensive business. Whilst researching my wife's family tree I found that the 1897 List of Electors for Norfolk, North Western Division records Horace Martin Wilkin (entry L241) as living at London Road, Lynn, and the Qualifying Property as Fairstead mill. I assume that he must have purchased the mill and leased it to William Tinkler.